It’s hard to imagine a bigger success than the Wachowskis' over-indulgent, ridiculous, confounding and gorgeous JUPITER ASCENDING, though I doubt the film’s ultimate financial take, review aggregator scores or pop cultural legacy will agree. As a movie, this latest sci-fi confection from THE MATRIX siblings Andy and Lana is maybe not so good. As a wild, drippy, impassioned love-letter to the classic space opera, though, it's outstanding. Right up until a gaggle of shape-shifting aliens make an attempt on her life, Jupiter Jones (Mila Kunis) spends her days cleaning toilets and laundering towels alongside her extended family, a clan of Russian immigrants eking out a living in present-day Chicago. As in THE MATRIX, the universe has larger designs on our protagonist, who, shortly after being rescued by genetically engineered, gravity skate-wearin' wolfman, Caine (Channing Tatum), discovers she's heiress to an intergalactic fortune. This fact doesn't sit well with the inheritance's current stewards - a trio of planet-harvesting, aristocratic siblings who are scouring the cosmos for Jupiter. It's a simple enough premise backed with a classic serial structure wherein Jupiter pays sequential and increasingly perilous visits to each scheming space royal - the vain, ambivalent Kallique (Tuppence Middleton), charming, conceited Titus (Douglas Booth), and, finally, the wrathful, venal Balem (Eddie Redmayne). What I'm not communicating effectively here is just how propulsive, grandiose and ludicrous the entire affair turns out to be. Amid plenty of gunplay, high-speed chases, and soapy romance, JUPITER's universe is packed with glorious, elaborate architecture - vast pillars, arches and soaring glass domes that look like a graceful collision between the classical, gothic and neo-futuristic - amid which lithesome, gravity-powered warships hurtle in kaleidoscopic formations. The costumes, ranging from streamlined renaissance-inspired lavishness to hemmed-and-creased regimental garb, are as lovingly designed as the characters who wear them. And there's all kinds of characters. This movie has huge, sentient flying lizards. It has a li'l spaceship-flying piggy. It's got masked cyborgs with guns for arms and courtesans galore. Sean Bean plays a man-bee hybrid named Stinger. *ahem* a man-bee named Stinger. Yes, behind all of JUPITER ASCENDING's action and beauty, there's a youthful, goofy enthusiasm that, depending on your temperament, is as liable to elicit a cringe as it is a smile. Quick litmus test: If you accidentally rolled your eyes when you saw that Kunis' character is named Jupiter, this may not be the movie for you. See, grand and creative though the Wachowskis' space kingdom may be, I could not even begin to explain how the world is structured or how the society works. In this sense, JUPITER is almost like watching two kids play make-believe - you can follow the action, but the rules of the reality are elusive and known only to the players. Seen through the viewer's eye, it's not world building - it's world immersion. How do the space royal's kingdoms work in relation to the government? Who's in charge of the police? Are any of the creatures alien species, or are they all spliced humanimals? And why doesn't Jupiter seem a bit more curious about any of this stuff? To the Wachowskis' credit, these questions wouldn't be nearly as maddening were their universe not so fraught with sheer possibility. And no amount of adult-brain nitpickery hampers one's ability to comprehend the hero/villain dynamic of a mid-air plasma gun shootout. Plus, everything with Jupiter's family is played as over-the-top comic melodrama between Russian caricatures. How do you spell telenovela in Cyrillic? Speaking of Jupiter, the gal is about as unflappable as they come, a trait which, when paired with Mila Kunis' laissez-faire performance, kinda just means she looks bored all the time. In space. Surrounded by bee-men. Tatum, meanwhile, trapped behind a Lon Chaney, Jr.-Lite werewolf hack-job, manages to exude approximately 0% of the charisma he's demonstrated in past performances. Eddie Redmayne (just off his recent turn as Stephen Hawking in THE THEORY OF EVERYTHING), on the other hand, does some standout, scenery chewing as the hissing, petulant Belam. With so many comic book films fixated on eluding the low-art associations shouldered by their source material, it's thrilling to see a movie that so enthusiastically embraces both the glory and pitfalls of its pulp origins. The impossible scenery, nigh magical tech, and boundless escapism is as fully present and unself-conscious as in the best space opera; The cardboard characters, saccharine melodrama, and inexplicable plot contrivances as deplorable as in the worst. 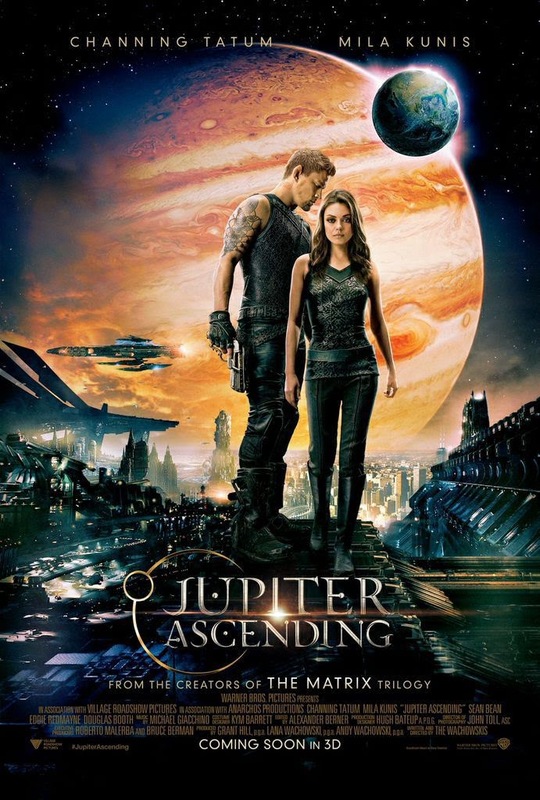 JUPITER ASCENDING is not the crowning achievement in pulp sci-fi cinema. It is not startlingly original nor daringly meta. It is every richly imagined, hastily written, never-anthologized science fiction epic published in Amazing Stories. One of the one's where the author maybe doesn't even get her name on the cover... or she does, but in 5-point font. It is warts and all, made-up-words, heart-and-spectacle, maudlin, insane space opera.